548 pages | 95 B/W Illus. Energy prices have varied hugely between countries and over time, yet the share of national income spent on energy has remained surprisingly constant. The foundational theories of economic growth account for only about half the growth observed in practice. Despite escalating warnings for more than two decades about the planetary risks of rising greenhouse gas emissions, most governments have seemed powerless to change course. Planetary Economics shows the surprising links between these seemingly unconnected facts. It argues that tackling the energy and environmental problems of the 21st Century requires three different domains of decision-making to be recognised and connected. Each domain involves different theoretical foundations, draws on different areas of evidence, and implies different policies. The book shows that the transformation of energy systems involves all three domains - and each is equally important. From them flow three pillars of policy – three quite distinct kinds of actions that need to be taken, which rest on fundamentally different principles. Any pillar on its own will fail. Only by understanding all three, and fitting them together, do we have any hope of changing course. And if we do, the oft-assumed conflict between economy and the environment dissolves – with potential for benefits to both. Planetary Economics charts how. Michael Grubb is Senior Researcher and Chair of Energy and Climate Policy at Cambridge University, UK and Senior Advisor on Sustainable Energy Policy to the UK Energy Regulator Ofgem. His former positions include Chair of the international research organization Climate Strategies; Chief Economist at the Carbon Trust; Professor of Climate Change and Energy Policy at Imperial College London, UK; and Head of Energy and Environment at Chatham House. He is editor-in-chief of the journal Climate Policy. Jean-Charles Hourcade is Research Director at the Centre National de la Recherche Scientifique and at the École des Hautes Études en Sciences Sociales, France. He is Professor at the École Nationale des Ponts et Chaussées and was formerly Director of the Centre International de Recherche sur l'Environnement et le Développement. He has advised the UNDP, UNEP, OECD, IEA and World Bank several times. Karsten Neuhoff is Head of Climate Policy at the German economics research institute Deutsches Institut fürWirtschaftsforschung (DIW), and is Professor at the School of Economics and Management at the Technical University of Berlin, Germany. Why not download our Routledge FreeBook Environmental and Ecological Economics? 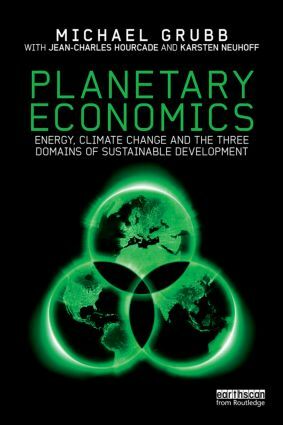 This resource contains a chapter from Planetary Economics, along with along with a selection of excerpts from our other titles in this field.